Marian Goodman Gallery is very pleased to announce a new installation by Maurizio Cattelan, which will open to the public on Tuesday April 30th, continuing through June 15th. Gallery hours are Monday through Saturday, 10 am to 6 pm. For his current exhibition, Maurizio Cattelan presents a new icon of subversion. Continuing his exploration of the mechanics of confrontation, Frank & Jamie is both an inverted image of power and a statement about the seduction of authority. In this work the artist celebrates and neutralizes order by deploying a weapon of simulation—a recurring tool in his figurative universe, as seen in previous works, such as the replica of the Hollywood sign installed in Palermo, Sicily, or in his hallucinatory portraits of Hitler (Him), and Pope John Paul the Second (La Nona Ora). As always, in choosing symbols whose representations offer complex systems of intertwined meaning, Cattelan's work refuses to take a precise moral or ideological position. This systematic practice of ambiguity is reflected in his new work, which functions both as an homage, as well as a utopian tribute in jeopardy. Cattelan's new intervention is an upside down monument: a frontal attack, and a disarmed figure of loss, Frank & Jamie is a call to truce in a moment of crisis. Since the early 1990s, Maurizio Cattelan's work has provoked and challenged the limits of contemporary value systems through its use of irony and humor. His work is currently on view in "sameDIFFERENCE" at the Ydessa Hendeles Art Foundation, Toronto, and at Castello di Rivoli, Torino. A new work, a semi-permanent installation, recently opened at the Museum Boijmans van Beuningen, Rotterdam. Other recent and upcoming projects include "Felix", a giant skeleton of a cat, which opened last Fall at the Museum of Contemporary Art, Chicago, and a solo exhibition which will open in September 2002 at the Museum of Contemporary Art, Los Angeles. 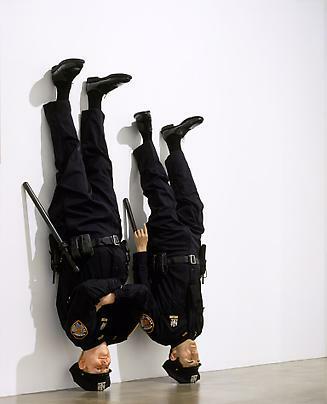 Maurizio Cattelan was born in Padua, Italy in 1960. His work has been exhibited widely nationally and internationally. In 2001, a special project for the 49th Venice Biennale was organized with the patronage of the City of Palermo, Sicily for the installation of an exact replica of the Hollywood sign on a site overlooking Palermo. His work has been on view in numerous solo exhibitions, at the Migros Museum für Gegenwartskunst, Zurich; Artpace, San Antonio, Texas; Forum, Centre Georges Pompidou, Paris; the Kunsthalle Basel, Basel; Project 65 at the Museum of Modern Art, New York; as well as at Castello di Rivoli, Turin; Le Consortium, Dijon; and Wiener Secession, Vienna. He's been included in several group exhibitions, including Place in the Mind: Modern Photographs from the Collection at the Metropolitan Museum of Art, New York; Let's Entertain, at the Walker Art Center, Minneapolis, which travelled to the Musee National d'Art Moderne, Centre Pompidou, Paris, the Museo Rufino Tamayo, Mexico City; and the Miami Art Museum, Miami; Apocalypse: Beauty and Horror in Contemporary Art, at the Royal Academy, London; the Lyon Biennial, Lyon; Expo 2000, Hannover; Skulptur Projekte, Landesmuseum, Münster; as well as "dAPERTutto", 1999, the Italian Pavilion, 1997, and Aperto 93, 1993, all successive exhibitions of the Venice Biennale.